We take your privacy seriously, and treat information about you as we would like information about us to be treated. We don't ask you for any personal details. If we start to provide services which absolutely require us to know about you, then we will make it clear to you what your details will be used for and how your data is protected. We do, however, have some systems in place to help us to run the site which collect anonymous data, which we describe below. We are a small company called The Bike Market Ltd (Company Number 10353652) who run this website from Peterborough in the UK. You can read more about us here, and we would love to hear any feedback you might have about our site. A website can ask your browser to store small pieces of data when you visit it. These pieces of data are called "cookies", and they can only be seen by the website that asked for them to be stored. If your browser has stored cookies at a website's request, then the next time you visit that website the cookies will be sent back to it. Cookies can be used for many reasons. A cookie might store any preferences you have set between visits to a website. Other cookies can be used to help to understand how a website is being used and so improved. Cookies can be removed by you at any time. A quick web search will give you information on how to do this in your particular browser. This system, provided by Google, uses two cookies (_gid and _ga) to help to track how our site is used. We use this to understand things like how people found our site in the first place, which pages are being viewed the most and which countries people are using the site in. All data is anonymised before it is stored, and so details of any particular individual's use of the website cannot be identified, neither by Google nor by us. If you want to opt out of Google Analytics for all websites you can do so easily by downloading a browser add on developed by Google. It's a small app which sits in your web browser and blocks Google Analytics from collecting any anonymised information about how you use the site. This system, again provided by Google, allows us to show a small advert on our model pages, near the used price guide. It uses one cookie (_gads) to help to track your interests by the webpages that you have visited, and so show you adverts it thinks are most relevant to you. The money we receive from showing these adverts helps to cover the costs of running our website, but we are aware that ads can be annoying and so we keep their number to a minimum. You may also download a piece of software for Windows/Mac called an Advert Blocker, which will remove most adverts from every website you visit. Google also have a setting which lets you turn off personalised AdSense adverts across all sites which use their AdSense service. We have already opted out of personalised adverts showing on this particular website but it might be handy if you want to minimise the annoyance elsewhere (those adverts which seem to follow you around the internet). It's a simple way of telling how much a bike loan might cost you per month and of handing you over to them anonymously if you want to enquire further. Some model pages feature a form to enter your VRM/registration number for help selling your bike. 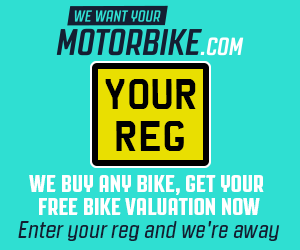 This information is passed directly to We Want Your Motorbike's website and is not stored by The Bike Market. We like to work with you to publish your experience of owning your bike or scooter. This may be via numerous communication channels (such as verbal, email, Facebook, Twitter etc.) but be assured that any personal details you give us will only be used to help publish the best review we can and nothing else.